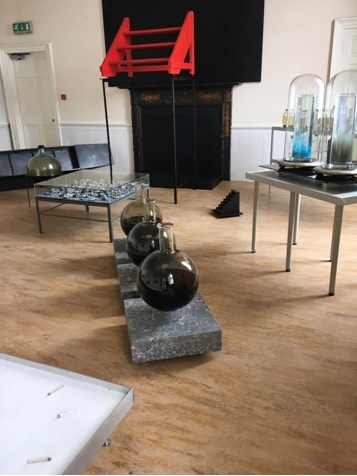 Part of the undoubted charm of the longstanding Pittenweem Arts Festival is discovering art in a huge variety of unexpected venues. In many cases the art is enhanced by its setting in what are normally domestic or commercial interiors. Add in the possibility of enjoying a lobster roll beside the harbour to sustain you between exhibits, and you have the recipe for a perfect day out in the East Neuk of Fife. As is to be expected, there is a wide range of work on offer, ranging from the amateur to the invited professional. 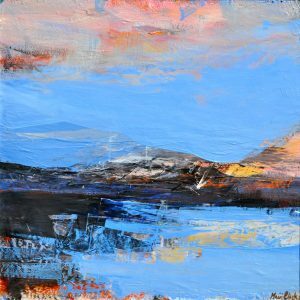 Given the setting, and the intense involvement of locally-based artists, it is no surprise that a great number of the works on display are landscapes. After all, international studies have demonstrated the fundamental human psychological preference for the horizon and the expanses of blue as found in landscape paintings – something that may be hardwired from our earliest ancestry. 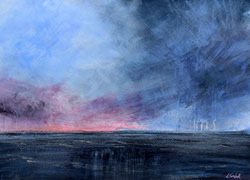 Amongst such a predominance of skies, seascapes and fields, it is exciting to encounter the intense vitality of the mark-making in the work of Louise Turnbull, a largely self-taught artist exhibiting at Pittenweem for the first time. 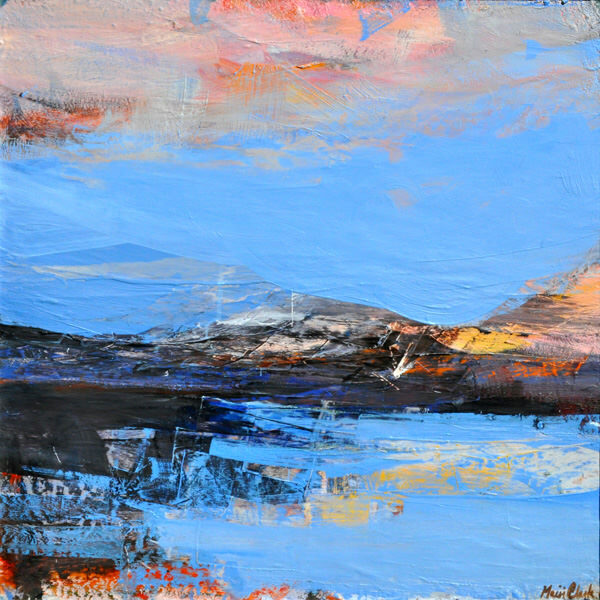 Great pleasure is also to be found in the work of more established artists, such as in Mairi Clark’s exuberant but careful use of colour, and Dominique Cameron’s immersion in urban and rural landscapes which results in a highly expressive handling of line. Not everything is serious: the inventive large-scale ceramics of Craig Mitchell depict whimsical inventions such as a personal distillery powered by motorbike, while Tim Cockburn’s colourful paintings of Scottish social gatherings perfectly encapsulate an atmosphere of kilted hilarity and drink-fuelled revelry. Among the invited artists the work of Derek Robertson and Glen Onwin could not provide greater contrasts in terms of subject matter and style. Robertson, a highly respected wildlife artist whose meticulous and beautiful depictions of birds are the result of close observation in the field, has turned his attention to the plight of refugees, seeing parallels in the migration of birds and human beings. In one venue we can admire his more usual wildlife works; in the other we see the results of his travelling to the Mediterranean and Middle East, and speaking and working with the refugees. 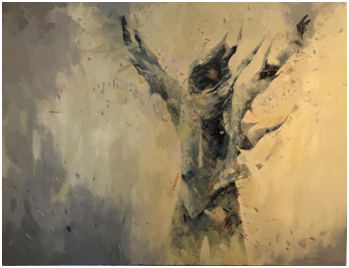 In some of these new paintings his birds appear, here seen amid the ruins of buildings and vehicles, but in others the people themselves take on a bird-like quality, the movements of their garments in the wind reflective of feathers and wings, with a refreshingly semi-abstract quality far removed from the precision of the field studies. Onwin’s work is at the opposite end of the spectrum, an installation of works created from elemental materials – salt, oil and dust. His work takes us well beyond the sphere of the human; the title of one work satirises the usual date label attached to art works: Fossil Oil, 200,000,000 to 145,000,000. His fascination with the fundamental elements of our environment is also seen in his references to the traditional creation stories, a black sphere reflecting on Bosch’s Garden of Earthly Delights and a circular glass surface backed by chalk, carbon and iron dust referring to Silva, primal matter as envisaged by the early philosophers. This is an exciting opportunity to see a selection of works successfully brought together, and to contemplate the fact that the elements of these works are continuing to change and evolve before our eyes: the crystals in Halophile, for example, have been deliquescing and changing since the early 1990s. Among the most attractive venues is Mangle Cottage, a stone cottage which is the gallery for a trio of talented young artists who delight, in different ways, in the use of colour: Lucy Anderson, Fiona Douglas and Kezia Lewis. 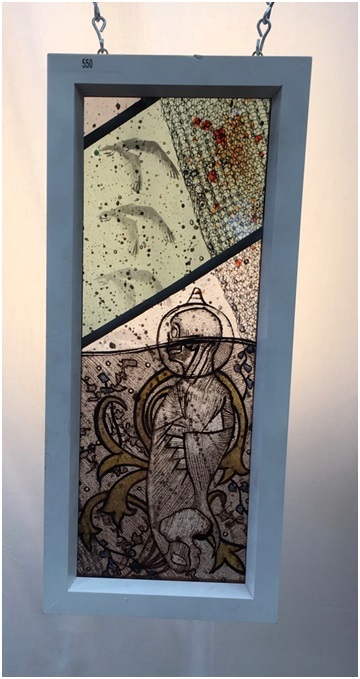 Also well worth a visit is the intriguing Net Loft, housing the edgy stained glass of Keny Drew and Julia Cowie’s beautifully worked small vessels, which repay close scrutiny by revealing tantalising hints of the processes involved in their creation. Thanks Cate for your kind comments, really enjoyed reading this especially as I didn’t get a chance to see many other artists!